I’ve been crafting! Well, not much but it was so good to get my craft supplies out last weekend and play. I have to thank my husband and one of my best friends for getting me two wonderful books that really helped me get out of my crafty slump. My friend Christine gave me Today, Tomorrow & Every Day. While this is not necessarily an art book, it is a book that inspires with it’s pretty images and quotes. This is one of those books you can open to any page and find some tidbit to inspire you. Whether it’s the color scheme that makes you think about using the same colors on a journal page or the quote that makes you want to write something. 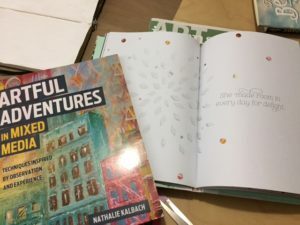 The book my husband got me is Artful Adventures in Mixed Media by Nathalie Kalbach. Whatever your medium, I think this is a book that can help you draw inspiration from your surroundings. With tips on how to collect and record what you observe whatever medium you work in. I took a short intro class with Nathalie Kalbach a couple of years ago at at art journal retreat and so I was really excited to get this book. I can’t wait to read through all of it. So now you are probably wondering what I did. 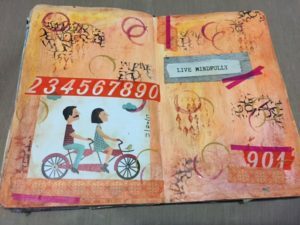 Aside from bookbinding, art journaling is something I really enjoy so I took out some gelatos, stamps, washi tape and my journal and using a little image I cut out of a magazine I created this two page spread. My intention was actually not for it to come out so orangey. Believe it or not I used yellow, orange and pink but for the most part the orange color is the one you can see the most. I haven’t used gelatos much and I think I learned that a little goes a long with with these colors. All you need to use is a bit of color on the page and with a wet brush you can easily spread the color throughout the pages. I’m going to try a different color scheme next time. I actually already have something that has inspired me and I’m going to try and recreate it so wish me luck. I think you know what I’ll be doing this weekend. Anyway, I promise to share more of my adventures. Along with crafting I’m really eager to get a bit more reading done this weekend. Hope you have a lovely weekend and let me know what crafty stuff you are up to! Glad you are feeling inspired to craft, enjoy the books! I am glad to see you are feeling inspired to craft again, Iliana. Sounds like you have a number of good books to help with that! I will copy you and try to get some art stuff done. I have been neglecting it for too long.